If your HVAC unit is installed improperly it can cause damage to the exterior and interior of your building. Oftentimes, building owners or facility managers will have to repair a leak ten times over only to then find out that improper installation is the underlying issue. Avoid improper installations by using a licensed installation service from the start. Screen installers by asking for recommendations / reviews or ask colleagues with successful installations who they suggest. Don’t forget to regularly inspect your HVAC unit! Typically, there is a tendency for individuals to forget that the unit is on the roof and let it battle the elements on its own. Thorough cleanings and periodic inspections are key for efficiency. It is also prudent to inspect your HVAC unit (and roofing system) after any storm to ensure that nothing has been knocked out of place. Water collecting on your commercial roofing system is never a good sign. Excessive standing water can increase structural live loads and be detrimental to the integrity of your roofing system. If you notice water ponding near your HVAC unit, be sure to call for maintenance immediately in order to prevent further damage. 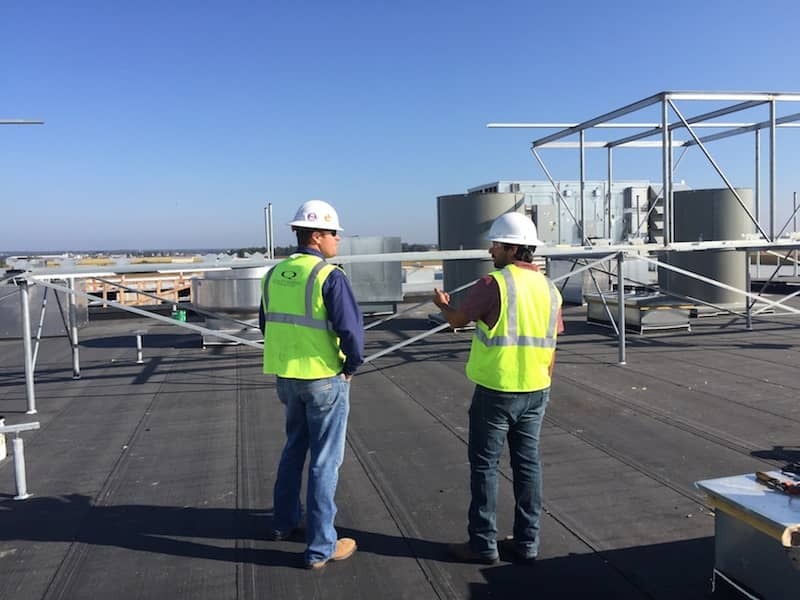 Regarding preventative measures, talk to your contractor during the roof installation process to ensure that proper drainage systems are in place. These systems will keep moisture away from the components of your roofing system in the event of a leak, rain, etc. It’s not always the HVAC unit that is at fault when roof problems arise. Individuals who are not trained properly can make matters worse when servicing HVAC units. These technicians might miss important signals that would point to the root cause or potential cause of a leaky unit. If you suspect a leak or potential for a leak, invite your roof inspector to join the HVAC inspector. Together, they will be able to determine if there are any underlying issues you need to worry about in addition to your HVAC. It is also important to note that untrained servicemen might not be aware of how to properly walk on a commercial roofing system. Anyone who gets on your roofing system should stay on walkways, so be sure to walk through this with your technician before sending them to your roof. Roofing problems caused by HVAC units can be frustrating, but by paying attention to the above factors, you can prevent potential problems from arising. What other preventative measures do you take with your HVAC units? Share your thoughts in the comments.